Last fall, Daniel Therrien, the government’s newly appointed Privacy Commissioner of Canada, released the annual report on the Privacy Act, the legislation that governs how government collects, uses, and discloses personal information. The lead story from the report was the result of an audit of the Royal Canadian Mounted Police practices regarding warrantless requests for telecom subscriber information. The audit had been expected to shed new light into RCMP information requests. Auditors were forced to terminate the investigation, however, when they realized that Canada’s national police force simply did not compile the requested information. 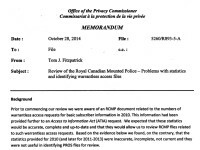 When asked why the information was not collected, RCMP officials responded that its information management system was never designed to capture access requests. While that raised serious concerns – the RCMP has since promised to study mechanisms for reporting requests with recommendations expected in April – my weekly technology law column (Toronto Star version, homepage version) reports that documents recently obtained under the Access to Information Act reveal that the publicly released audit results significantly understated the severity of the problem. Indeed, after the draft final report was provided to the RCMP in advance for comment, several of the findings were toned down for the public release.